As a part of their Georgia State Park's 85th Anniversary Hidden Gems Series, Tallulah Gorge State Park is offering a guided Tugaloo Lake Paddle. This paddle on beautiful Tugaloo Lake is happening May 14th and begins at 10am. This relaxing and scenic paddle will begin in the morning and will be guided to a spot on the lake to have lunch. After enjoying lunch, the guide will lead to back to shore. This is the first year that the parks have launched the Hidden Gems series, so this is the first event hosted by the rangers that highlights a paddle on Tugaloo Lake. 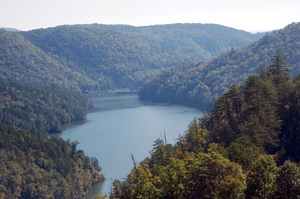 The lake is located in the northeast section of Tallulah Gorge State Park on the border of Georgia (Habersham and Rabun counties) and South Carolina (Oconee County). The reservoir is 597 acres. A portion of the lake is within park boundaries and you drive on an unpaved road to the lake boat ramp. As a result of the roads to the Lake being somewhat obscure, you will need a four wheel drive or an all wheel drive vehicle. The road leading to the lake is a gravel road that is steep in spots. Children must be 8 or older. Meet at the Interpretive Center from there we will drive down as a group (you can car pool). Have you ever participated in a Hidden Gems event? Feel free to tell us about it by contacting us.